Leading Telecom Operator in India Bharati Airtel has increased 2G Data plan rates last week followed by Vodafone, Idea Cellular and others. Recently BSNL has rationalized of BSNLTARIFF under both 2G and 3G Mobile services and Introduced New Special Tariff Vouchers (STVs) with Unlimited features under Voice, SMS and Data services. Now, Bharati Airtel has increased 25% of rate after cutting down on freebies to its customers. Airtel Customers are getting existing Rs.100 vouchers with 2GB data usage plan now available at Rs.125/- (Data plan) with 1GB free data usage. 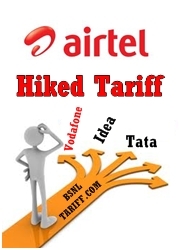 In continuation to the above Airtel Competent Authority has announced to raise their call tariff and data prices (3G) in the weeks ahead after restricting 2G data plan to only 1GB data usage. Vodafone and Idea Officials also added that they are also expected to increase select 2G data plans this week across India.